Day of event check in and registration: 10:30 am - 12:45 pm. All teams must check out through the course finish gate before leaving the park, even if the team does not finish the course or returns after the course closes. Scout orienteering is always held on the Saturday following Easter. 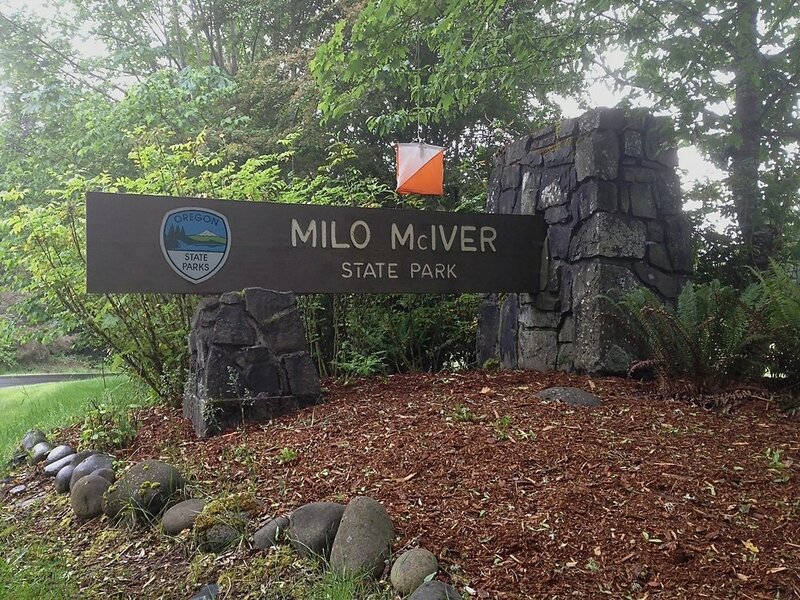 It alternates every year between Champoeg and McIver State Parks. This event is open to everyone: scout / youth groups AND the general public / adults. Cub Scouts, Boy and Girl Scouts (and other kid-oriented groups) of all ages and skills are invited to participate! Come and enjoy a day of fun and friendly orienteering practice and competition. This event gives scouts a chance to improve their outdoor skills and navigate the beautiful trails of this park. The orienteering courses consist of a series of flags ("controls") set up in around the park. Scouts will participate in pairs or in small groups, scouts navigate to each control in order and return to the finish area. Instruction clinics will be provided to help Scouts interested in passing off requirements for the Orienteering merit badge or interest project. 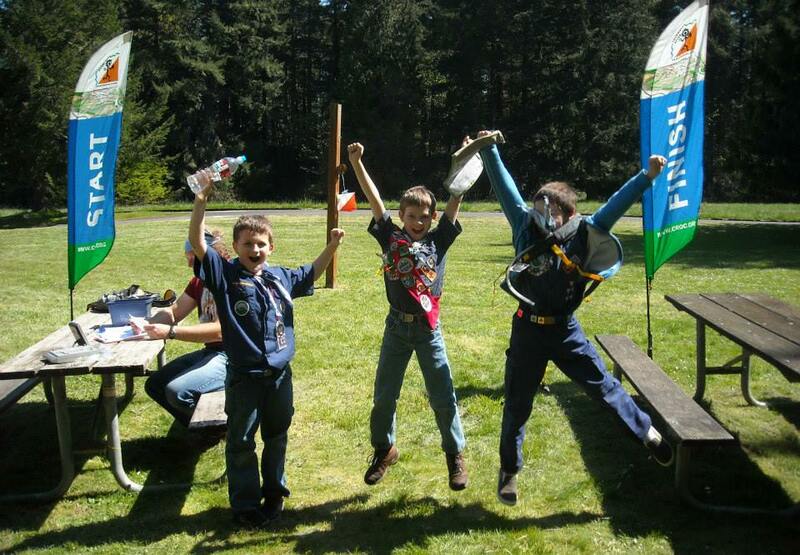 Scouts attending the Scout-O will be grouped according to rank and will navigate courses matched to their skill level. Note that overnight camping is offered at this park. Have your scouts read our "New to O" webpage, and watch the short kid-made Youtube video on the basics of orienteering, also on this page. Doing so will give kids and leaders an idea what to expect the day of the event and make your day go more smoothly. The Scout-O will offer four levels of orienteering courses, with the intention that Scouts will compete with other Scouts of the same rank. Please read the following course descriptions carefully and be sure your Scouts are registered for appropriate courses. Note: The beginner course is noncompetitive and for learning the basics only. The Beginner course is a non-competitive course designed to introduce Cub Scouts, Webelos, Brownies, Juniors, and Explorers to orienteering. Scouts will participate in small teams of two to four. Each group must be accompanied by an adult, who should follow his/her group, not lead it. The Beginner/Intermediate course is intended for pairs of Tenderfoot, Second Class and First Class Boy Scouts; Girl Scout advanced Juniors and Cadettes; and American Heritage Girl Explorers and Pioneers. It is recommended that an adult trail the pair, but NOT communicate with the Scouts except in the case of an emergency. The Intermediate course is intended for pairs of Star, Life and Eagle Boy Scouts; Girl Scout advanced Cadettes, Ambassadors and Seniors; and American Heritage Girl Patriots. No adults are allowed to accompany teams on this course. The Advanced course is for individual entrants only - no pairs. It is limited to Scouts (including Explorers and Adult Scouters) with a fair amount of previous orienteering experience. That really depends on the kids. Some race through their courses in less than 1 hour, others take their time and stay out 2 to 2-1/2 hours. This is true of all the courses. What about compasses? A compass is not needed on most courses, just decent map reading skills. CROC do not have time at the beginner clinics to teach compass use beyond the basics. If you want more compass instruction, see our wIlderness navigation tutorial videos on Youtube. What merit badge requirements can be completed through this event? Scouts should be able to pass off requirement 1a for 2nd Class (explain map and compass - the course is not long enough to pass off 1b, but you could probably make it so if you go back and forth along the course enough times), and requirement 2 for 1st Class (including the height measurement, although it is not really part of a standard orienteering course). Scouts can also pass off requirements 2, 3a, 4, 6 and 7a for the merit badge. If the scouts intend to pass off these requirements, it will work best if they come ready to show/explain/identify; there are so many groups coming through there isn't enough time to properly explain everything and then test each scout. It will also help give them a better experience if they have already reviewed the merit badge workbook before coming. The workbook is online here. Cost = $10 per team if you RSVP before 1:00 pm on Friday April 26. $20 per team after that. Note that payment, registration, and waiver forms must be filled out the day of the event. These fees do not include any extra daily use fee charged by the park. You must pay these separately. Oregon State Parks charges $5 for day use. 12 and 24 month passes are available. Results will be posted on the Events & Results page a few days after the event. Latitude longitude coordinates of the event site. Copy and paste these into a mapping app on your phone or Google maps to get a map and driving directions to this location. From Portland City Center, go to Clackamas on I-205. Take Hwy 224 east to Estacada. In 1 mile, turn right onto S Hayden Road. In 1.2 miles, turn right onto S Springwater Road.